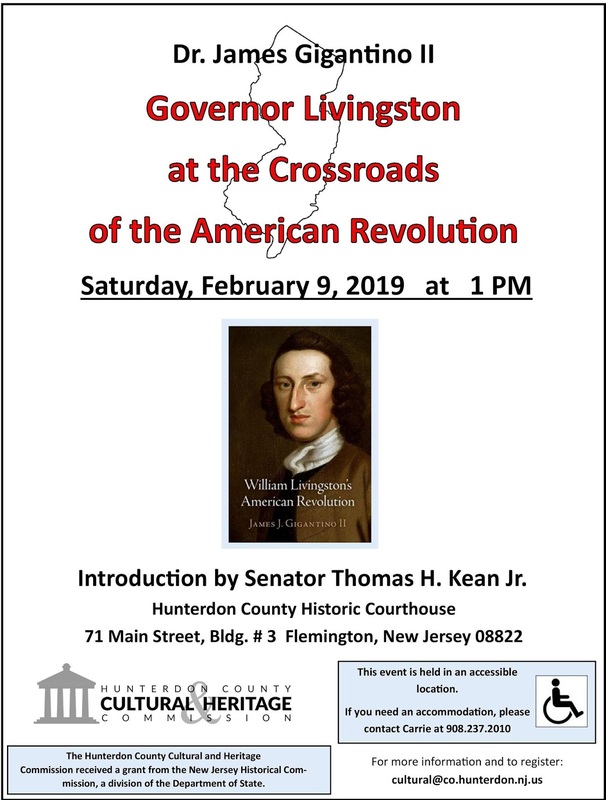 Dr. James Gigantino Presents: "Governor Livingston at the Crossroads of the American Revolution" - 2/9/2019 ~ The History Girl! Dr. James Gigantino Presents: "Governor Livingston at the Crossroads of the American Revolution"
Please join the Hunterdon County Cultural and Heritage Commission as we welcome Dr. James Gigantino II to discuss his recently published biography of New Jersey’s first governor, William Livingston’s American Revolution. After working as a lawyer in New York City for over 20 years, William Livingston retired to Elizabethtown (modern day Elizabeth, NJ) to live a quiet life. There he was drawn into the growing resistance to Parliamentary involvement in colonial affairs and quickly rose to a leadership role as a delegate to the Continental Congress, where he served from 1774 to 1776, when he was elected governor. Governor Livingston exercised extraordinary power through the Council of Safety during the critical first years of the American Revolution. New Jersey’s proximity to loyalist held New York, allowed Governor Livingston to have an immediate impact on the war as he “struggled to mobilize reluctant militiamen, rein in loyalists as well as his own rambunctious legislature, and staunch the flow of intel into British-held New York City” (Woody Holton). After the war, he served in the Constitutional Convention. Livingston was re-elected governor every year from 1776 until his death in 1790. The presenter, Dr. James Gigantino II, is Associate Professor and Chair of the History Department at the University of Arkansas. As an early American historian, he has taught courses on Colonial, Revolutionary, Early National, and Antebellum America. However, his area of interest extends beyond the borders of the United States as he also studies slavery and the Atlantic World and has taught courses on African American history, comparative slavery, the Atlantic World, and Modern Africa. In his second book, William Livingston’s American Revolution, Dr. Gigantino turns his attention to New Jersey’s first governor and his role in a war that saw a collection of colonies take on a global empire. Although he was initially opposed to independence William Livingston went on to hold office longer than any other patriot governor. As a “lawyer, author, polemicist, and the only state governor to serve through the Revolution, William Livingston started as a reluctant Revolutionary, led New Jersey through a bitter civil war, and emerged a supporter of stronger national government” (Maxine N. Lurie). Through Livingston’s eyes Dr. Gigantino portrays the complex relationship between administrators like the book’s namesake, the nascent national government, and the American people. 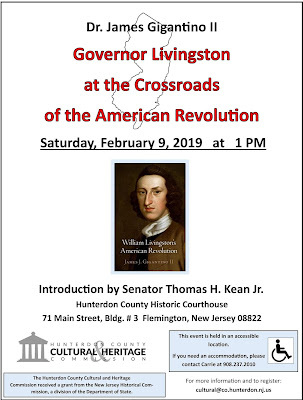 The event, entitled "Governor Livingston at the Crossroads of the American Revolution," will be held on Saturday, February 9, 2019 at 1:00 pm at the Hunterdon County Historic Courthouse in Flemington, NJ. Copies of William Livingston’s American Revolution will be available for purchase following the talk. Anyone interested in attending is encouraged to register by emailing cultural@co.hunterdon.nj.us. Parking is available in the county lot on Court Street. The historic courthouse is an accessible location.